One third of all American women have an abortion in their lives. Are they all immoral? One in three women has an abortion by the age of 45. How many ever talk about it? Of all the battles in our half-century culture war, perhaps none seems further from being resolved, in our laws and in our consciences, than abortion. It’s a fight now in its fifth decade, yet in the past two years, 26 states have passed over 111 provisions restricting abortion. In Texas, the state where the single, pregnant woman who became Jane Roe sued for access to an abortion 41 years ago, Wendy Davis became a national hero for filibustering abortion legislation, as did her governor for signing it into law. Lawsuits have been waged and courts have adjudicated, and still we seem no closer to consensus on when, where, how, and if a woman should be able to terminate a pregnancy. Even in Roe v. Wade, the Supreme Court was qualified in its judgment: An abortion was a personal decision only in the first trimester; in the second, states could intervene on behalf of the woman’s health; once the fetus was considered “viable,” a state could set whatever limitations it saw fit. 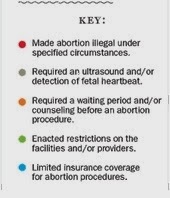 Successive court rulings have granted even more latitude in writing abortion laws, and legislators have responded by creating a patchwork of regulations: Arkansas has banned abortion after twelve weeks, while in Louisiana, a woman is shown her ultrasound before having an abortion. In California, a trained nurse practitioner can now perform an abortion, but in Mississippi, a provider must be an obstetrician with admitting privileges at a local hospital, a rule that could shut down the state’s last remaining clinic. This month, a federal appeals court upheld a similar law in Texas, closing all but a handful of clinics. But for all the regulations and protests, despite “safe, legal, and rare” and “abortion is murder,” abortion is part of our everyday experience. Nearly half of all pregnancies are unintended; about half of those—1.2 million—will end in abortion each year. Texas state Sen. and Democratic gubernatorial candidate Wendy Davis continues to support women's abortion rights but she wants to reduce the number of abortions, she told a CNN affiliate Monday. "The goal that we should have is that we see zero abortions," Davis told KGBT. "But in order to achieve that goal we have to make sure that women are receiving the kind of healthcare and planning that they deserve." That will never happen and nobody should be saying it will. Human biology will always trump birth control from time to time and women don't have abortions just because they don't have "resources." Bearing a child is much more than an economic commitment and going through pregnancy and childbirth is not a simple matter of marking time for 9 months until you can just go back to your former life. Women have always had abortions and they always will. This idea that there should be "zero" abortions only reinforces the idea that it is an immoral act. Anyway, read the article which features a bunch of stories by real women about their reasons for having an abortion. Nothing is more intimate and personal than gestating another life within your own body. And then ponder whether it makes any sense at all for distant strangers in black robes or politicians in legislative bodies to insert themselves into that situation.